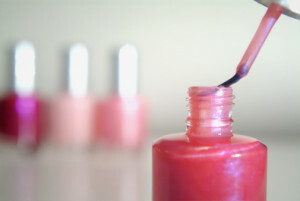 Isopropyl acetone, methyl ethyl ketone, and n-methyl-pyrrolidone, are commonly used as the solvent in nail polish removers. Evidence suggests that these chemicals may cause reproductive harm and organ toxicity. They are a serious concern for nail salon workers and pregnant women. Isopropyl acetone is also a ketone used in lacquers. MEK is mainly used as a solvent in application of protective coatings and adhesives and in food processing. It is also a common ingredient in varnishes and glues. NMP has many purposes including stripping paint, removing graffiti, laboratory reagents, insecticide/fungicide/herbicide products, and pharmaceutical solvents. NMP’s main modes of exposure include inhalation and dermal pathways. Isopropyl Acetone: Studies conducted on humans exposed briefly to isopropyl acetone experienced respiratory and/or eye irritation, headache or nausea. , In a long-term study of occupational exposure, 19 workers were exposed to isopropyl acetone for 20-30 minutes per day for five years. More than half of the workers complained of headache, eye irritation, nausea, sore throat, and weakness. A few workers had heartburn, insomnia, and intestinal pain. After five years, the amount of isopropyl acetone in their work environment decreased by approximately 75% and for all except for two workers, their previous symptoms disappeared. Isopropyl acetone may also lead to organ toxicity, particularly of the kidneys. In two studies conducted on rats, those exposed to isopropyl acetone developed non-cancerous lesions on their kidneys, This effect was more severe and pronounced in male rats, though female rats also had increased incidence of mild kidney disease. In addition, isopropyl acetone is potentially neurotoxic due to the presence of methyl n-butyl ketone (a known neurotoxin) as an impurity. One study linked isopropyl acetone to renal tubule carcinoma and/or adenoma. Methyl Ethyl Ketone: Human occupational studies point to the possibility of MEK as a neurotoxin. A study of 41 factory workers exposed to MEK noted that workers experienced headaches, memory difficulties, and irritability. Workers also reported eye irritation, respiratory tract irritation, and muscular and joint pains. A study of exposed shoe factory workers also found neurological symptoms; workers suffered from headaches, chest pains, sleep disorders, dizziness, and drowsiness. Data gaps remain regarding the extent of exposure in both studies. A study of aircraft workers exposed to MEK and other solvents found that women with higher exposures of MEK had elevated risks for multiple myeloma, although the results were not statistically significant. Furthermore, workers were exposed to multiple solvents, which make efforts to solely attribute increased mortality to MEK difficult. Pregnant rats exposed to MEK showed decreased weight gain and skeletal malformations were found in their offspring. These studies support the connection between MEK and developmental toxicity. N-Methyl-Pyrrolidone: California’s Proposition 65 identifies NMP as a reproductive toxin. Pregnant rats exposed to NMP have increased incidence of maternal toxicity, including symptoms such as fewer live fetuses per rat and decreased weight gain and food consumption. Furthermore, the offspring of the NMP-exposed rats were more likely to develop internal and external malformations and have lower birth weights. After birth, these offspring suffered from delayed physical development, struggled with completing spatial tasks and had lower body weight. Other studies have also found lower birthweights in the offspring of NMP-exposed rates, although in some studies the effect either normalized over time, or had no impact on later development. In humans, NMP has been reported to induce acute contact dermatitis, with symptoms such as swelling and itching. NMP is able to penetrate latex easily, and thus produces these skin reactions even in workers wearing latex gloves. NMP is also a severe eye irritant that can cause headaches at exposure levels as low as 0.7 ppm in the air for 30 minutes. REGULATIONS: Isopropyl Acetone is restricted to low doses in workplace environments in the European Union. The US Occupational Safety and Health Administration limits the amount of Methyl Ethyl Ketone that workers can be exposed to in an average workday. N-Methyl-Pyrrolidone is prohibited for use in cosmetics in the European Union due to links to cancer, mutagenicity or reproductive toxicity. It is also listed on California’s Proposition 65 list of known chemicals to cause cancer, birth defects, or other reproductive harm. HOW TO AVOID: Consumers can choose nail polish removers without these chemicals. Nail salon workers and owners should follow through with protective actions such as committing to adopting safer nail products, wearing nitrile gloves, installing appropriate ventilation, and training all staff on safety procedures. Hjelm EW, Hagberg M, Iregren A, and Löf A. “Exposure to methyl isobutyl ketone: toxicokinetics and occurrence of irritative and CNS symptoms in man.” Int. Arch. Occup. Environ. Health. 1990. 62: 19-26 Print. Armeli G, Linari F, and Matorano G. “Clinical and haematochemical examinations in workers exposed to the action of a higher ketone (MIBK) repeated after 5 years.” Lav. Um. 1968. 20:418-424. Print. Seely JC, Haseman JK, Nyska A, Wolf DC, Everitt JI, and Hailey JR. “The effect of chronic progressive nephropathy on the incidence of renal tubule celle neoplasms in control male F344 rats.” Toxicol Pathol. 2002 Nov-Dec;30(6):681-6. Print. Borghoff SJ, Poet TS, Green S, Davis J, Hughes B, Mensing T, Sarang SS, Lynch AM, and Hard GC. “Methyl isobutyl ketone exposure-related increases in specific measures of α2u-globulin (α2u) nephropathy in male rats along with in vitro evidence of reversible protein binding.” Toxicology. 2015 Jul 3;333:1-13. doi: 10.1016/j.tox.2015.02.003. Epub 2015 Mar 19. Print. Johnson W Jr. “Safety assessment of MIBK (methyl isobutyl ketone).” Int J Toxicol. 2004;23 Suppl 1:29-57. Print. Mitran E, Callender T, Orha B, Dragnea P, and Botezatu G. “Neurotoxicity associated with occupational exposure to acetone, methyl ethyl ketone, and cyclohexanone.” Environ Res. 1997;73(1-2):181-8. Print. Oleru UG and Onyekwere C. “Exposures to polyvinyl chloride, methyl ketone and other chemicals. The pulmonary and non-pulmonary effect.” Int Arch Occup Environ Health. 1992;63(7):503-7. Print. Spirtas R, Stewart PA, Lee JS, Marano DE, Forbes CD, Grauman DJ, Pettigrew HM, Blair A, Hoover RN, and Cohen JL. “Retrospective cohort mortality study of workers at an aircraft maintenance facility. I. Epidemiological results.” Br J Ind Med. 1991 Aug;48(8):515-30. Print. Blair A, Hartge P, Stewart PA, McAdams M, and Lubin J. “Mortality and cancer incidence of aircraft maintenance workers exposed to trichloroethylene and other organic solvents and chemicals: extended follow-up.” Occup Environ Med 1998;55:161-171. Print. Deacon MM, Pilny MD, John JA, Schwetz BA, Murray FJ, Yakel HO, and Kuna RA. “Embryo- and fetotoxicity of inhaled methyl ethyl ketone in rats.” Toxicol Appl Pharmacol. 1981 Jul;59(3):620-2. Print. Schwetz BA, Leong BK, and Gehring PJ. “Embryo- and fetotoxicity of inhaled carbon tetrachloride, 1,1-dichloroethane and methyl ethyl ketone in rats.” Toxicol Appl Pharmacol. 1974 Jun;28(3):452-64.
itarek K, Stetkiewicz J, and Wasowicz W. “Evaluation of Reproductive Disorders in Female Rats Exposed to N-Methyl-2-Pyrrolidone.” Birth Defects Res B Dev Reprod Toxicol. 2012 Jun;95(3):195-201. Print. Lee KP, Chromey NC, Culik R, Barnes JR, and Schneider PW. “Toxicity of N-methyl-2-pyrrolidone (NMP): teratogenic, subchronic, and two-year inhalation studies.” Fundam Appl Toxicol. 1987 Aug;9(2):222-35. Print. Saillenfait AM, Sabaté JP, and Gallissot F. “Comparative developmental toxicities of the three major metabolites of N-methyl-2-pyrrolidone after oral administration in rats.” J Appl Toxicol. 2007 Nov-Dec;27(6):571-81. Print. Hass U, Lund SP, and Elsner J. “Effects of prenatal exposure to N-methylpyrrolidone on postnatal development and behavior in rats.” Neurotoxicol Teratol. 1994 May-Jun;16(3):241-9. Print. Saillenfait AM, Gallissot F, and Morel G. “Developmental toxicity of N-methyl-2-pyrrolidone in rats following inhalation exposure.” Food Chem Toxicol. 2003 Apr;41(4):583-8. Print. Solomon HM, Burgess BA, Kennedy GL Jr, and Staples RE. “1-Methyl-2-pyrrolidone (NMP): reproductive and developmental toxicity study by inhalation in the rat.” Drug Chem Toxicol. 1995 Nov;18(4):271-93. Leira HL, Tiltnes A, Svendsen K, and Vetlesen L. “Irritant cutaneous reactions to N-methyl-2-pyrrolidone (NMP).” Contact Dermatitis. 1992 Sep;27(3):148-50. Print. Zellers ET and Sulewski R. “Modeling the temperature dependence of N-methylpyrrolidone permeation through butyl- and natural-rubber gloves.” Am Ind Hyg Assoc J. 1993 Sep;54(9):465-79. Print. Beaulieu HJ and Schmerber KR. “M-PyrolTM (NMP) Use in the Microelectronics Industry.” Applied Occupational and Environmental Hygiene. 1991 Apr;6(10)L 874-880. Print.